Despite a bitterly cold February morning Marlows first auction of 2017 saw a full saleroom for the start of the sale which began with a selection of 207 badge lots, containing some desirable items, fierce battles between internet and room bidders ensued. Marlows policy of of being able to view and clear during the sale enable a steady stream of room bidders to arrive throughout the sale and even after a long 659 lot auction, the room had active room bidders as the hammer fell for the last lot. 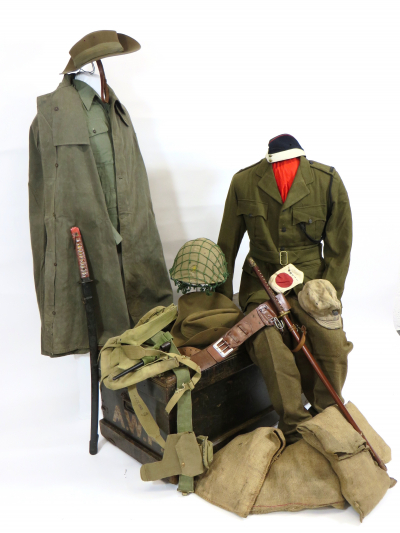 Some notable prices were achieved the Marlows discovering of a “War Booty” chest of Japanese items caused quite a stir with a rare “untouched” Japanese combat helmet with cover and netting selling for a hammer price of £1,200, British airborne collectors paid £900 for a rare 1943 leather harness jump helmet, £750 for a 1942 Denison smock and although post WW2 dated a wartime pattern example of the Airborne Forces Leg Drop Bag sold for £750. Badges were ever popular, but a collection of British police badges achieved a number of surprising high prices the top price being £850 for lot 124 a Small Selection of Police Helmet Plates. Now the British law on deactivated weapons has been clarified this sale saw a “new spec” WW1 Webley MK6 Revolver sell for £650 and a rare WW2 Pattern Piat Anti Tank Launcher sold to a room buyer at £1,700.